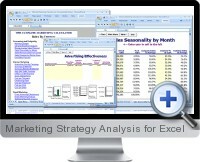 With the Marketing Strategy Analysis Templates, you will be able to chalk out your marketing plans. In one integrated Excel workbook, the user can easily select the 38 marketing worksheets from a main menu to make precise marketing calculations. Compute the lifetime value of your customers. Calculate the acquisition cost of your customers by promotional campaigns, cost of coupon promotions, and promotional payback analysis. Calculate the return you are earning on the time you invest in your individual customer accounts. Calculate new economy metrics such as email ROI, forecast email sales, and web site traffic. Calculate Price estimates for goods and services. Calculate marketing and sales ratios and metrics such as Selling expense ratio, Inventory turnover, Mark-ups and mark-downs, Average collection period. Score card and similar comparative analysis such as Business Strength Analysis, Competitive Analysis, Marketing Scorecard and Market Attractiveness Analysis.